"This is history, the energy here is crazy. I've never seen anything like this - this is another level of inspiration. He's at G.O.A.T status, another level. Legendary." It's clear UK rapper Konan is still in awe of what he's just witnessed. 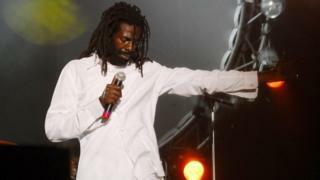 Buju Banton is the artist who's just performed - it's his first headline show since serving eight years in a US prison for drug charges. It's been described as the biggest music event in Jamaica since Bob Marley's Smile Jamaica concert in 1976. Jamaica's national stadium, which hosted the concert, is listed as having a capacity of 35,000. For the first night of Buju Banton's Long Walk to Freedom Tour it's estimated there were more than 40,000 people there. "I haven't seen anything like that and I have been to a few concerts. To come out and do this, that's crazy," Konan says backstage after the show. BBC 1Xtra's Seani B says anticipation in Jamaica has been building since the date of the show was leaked. "Flights were booked out, hotels were fully booked, Airbnbs were booked out," he tells Radio 1 Newsbeat. "Every club, bar and radio station was playing Buju Banton. "I spoke to fans who had travelled from Europe, America and the UK to see him - that's how much of a column in dancehall this man is." Although he's always maintained his innocence, Buju Banton was convicted in 2011 of conspiring to set up a cocaine deal two years earlier. During his career he's been accused of using homophobic lyrics - which has led to protests outside his gigs and prompted some radio stations to ban some of his songs. Seani B says Buju Banton has "done his time" for the drug charges. "He's a free man, he should be allowed to continue the journey he was blessed with and that's bringing music to the world." UK rapper Stefflon Don was one of the night's performers alongside Buju Banton. She described it afterwards as the "best moment" of her career. "From a kid, all my dad would play around the house was reggae and dancehall music," she wrote on Instagram. "This moment here means the world to me and it takes me back to my childhood." Dancehall singer Koffee said Buju sets a "positive example" for young artists like her. "To be honest with you Buju is a legend, people like him set the pace for me." Protoje, another reggae star at the event, said: "I spoke to him since he's been back. Just the fact he knows my name or who I am, I give thanks just for that. "I can only imagine what it was like not being on stage for eight years, just the overwhelming emotions he must have gone through. I am happy for him." "You can see from the Buju Banton that was on stage that he's ready for business. He's one of the columns of dancehall and I don't think he's going anywhere... he's still reigning as a champion." Seani B will have extended interviews and highlights from the concert during his dancehall show on Thursday on 1Xtra.